Relax at Villa Fleur in luxurious surroundings. Renovated in 2018 it has a fully equipped kitchen with bar seating and dining area. The living room features comfy furniture and a panel TV. One queen bedroom and one twin bedroom. Enjoy outdoor dining on the brick patio surrounded by a tropical landscape. Villa Fleur is located in the Shipyard Condominiums at the Truman Annex. 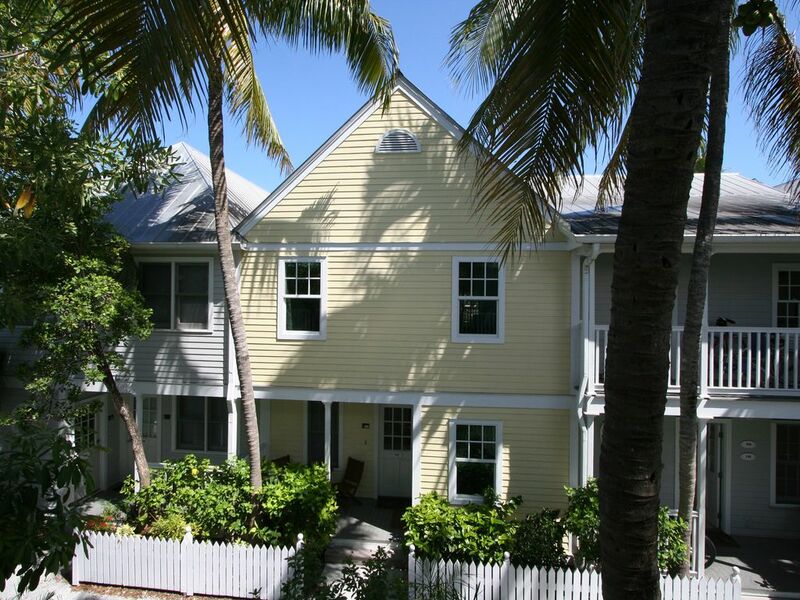 The Shipyard is in the heart of Old Town Key West on the former U.S. Navy property of Truman's Little White house. Just steps from Duval St. and located near the Ft. Zach beach and Hemingway's house, all of Old Key West's sites are within easy walking distance. Our private oasis can be your tropical retreat. This rental is a couple blocks off Duval, a short distance from a playground and splash pad (free) and right next to Fort Zach (the best beach on the island). It is a quiet and peaceful spot within walking distance of everything. Walk to Blue Heaven or the Hemingway House, or just relax in the pool. The unit itself is beautiful and clean. There is a private patio surrounded by tropical foliage. We would love to stay he again on our next trip to the island. Nice area. The condo was a great retreat after a day of kayaking or snorkeling with the kids. Only flaw was the parking area was not accessible due to repaving. But I was forewarned by the owner so was prepared. The house was clean decorated nicely and had everything you needed to make a nice dinner and the location was perfect! We enjoyed our vacation stay at Villa Fleur! The condo was clean and ready for us to just unpack our bags, stock the refrigerator with drinks & food (for the days when someone didn’t feel like going out to eat) and head out for site-seeing and relaxing. The pool is nestled in a tropical setting with plenty of seating in the shade or the sun. We enjoyed mornings under the palm trees on the patio before heading to catch the nearby Duval Loop (air conditioned, free) bus service to take us to all our site-seeing destinations. The beach was close enough to bike to and we enjoyed lunch at the patio grill right on the beach. The complex felt safe day and night. The staff at the complex and security were onsite and someone was always at the gate to greet us. Great family friendly area! The morning we checked out, we packed our bags and left without a worry or a concern. We are looking forward to our next trip and we will be sure to check into reserving one of Joe’s condos! It was very well appointed and clean. Me and my family enjoyed our time there immensely. Only 2 blocks from Duval, and biking distance to a beach. Special Events and Holidays may be a higher rate. Cleaning Fees are included. Sales tax of 12.5% is not included in rate. Cleaning fees are included. You must be 25 to rent this condominium.